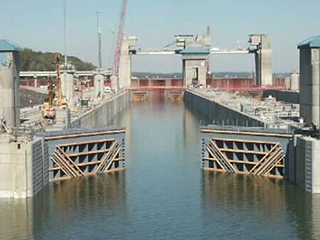 The Olmsted Lock and Dam project was authorized by Congress in 1988 and construction commenced in 1993. The new twin lock chambers were constructed between 1995 and 2002. Construction of the dam is ongoing. The new dam will consist of five massive tainter gates measuring 110’ wide by 41 feet tall and 140 wicket gates to facilitate navigation. In 2014, Mahan was awarded a fixed-price, best-value contract to replace hydraulic cylinders on the miter gates and culvert valves in the lock chambers and associated improvements. The work scope included dewatering both lock chambers, cleaning of miter gates and culvert valves, extension of two maintenance bulkhead reinforced concrete sills, replacement of air bubbler and grease lines in the lock chambers along with solenoid valves on the bubbler system, repair of culvert valve latching bars, addition of a culvert valve support beam and replacement of lock control systems. Also included is the removal and replacement of the hydraulic cylinders for eight miter gates and eight culvert valves, fabrication of two new spare hydraulic cylinders for miter gates and culvert valves, and replacement of sixteen latching hydraulic cylinders including four spares. The project was originally envisioned as a two season operation in order to maintain one lock chamber in service at all times. Mahan proposed and the USACE agreed to an acceleration of the contract whereby work in both chambers could be completed in 2015. 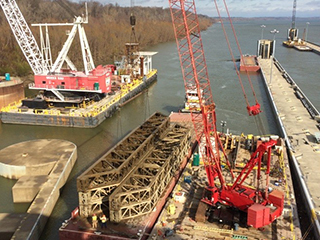 The balance of work completed in 2016 consisted of removing and replacing hydraulic cylinders that were delayed due to a material design change initiated by the USACE. This work was completed in 2016 without dewatering the lock chambers and with minimal disruptions to lock operations.